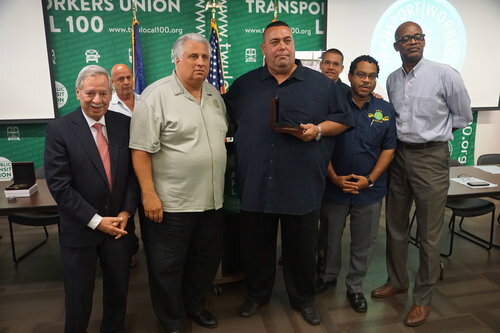 TWU Local 100 President Tony Utano marked the 17th anniversary of the rescue and recovery effort at Ground Zero by honoring five transit workers, who have verified illnesses caused by their service at Ground Zero. 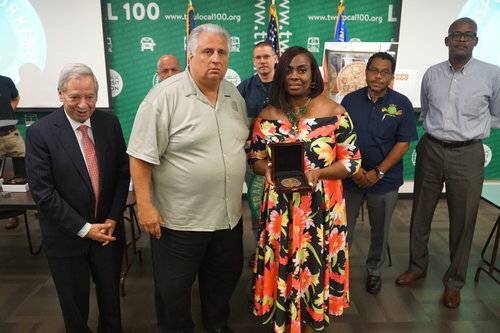 Honored with the union's 9/11 service medal were CTA Gwendolyn Broughton, Structure Maintainer Dennis Buccello, Trackworker Dan Demody, Structure Maintainer Bobby Nash, and Track Specialist Johnny Sparks. Each of them has had a claim for victim's compensation because of 9/11 illness accepted by the federal government. 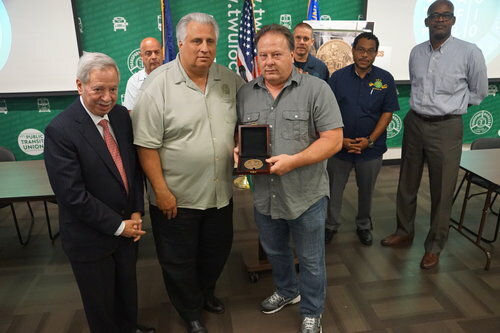 In addition, more than a dozen other workers received 9/11 recognition pins from the union. 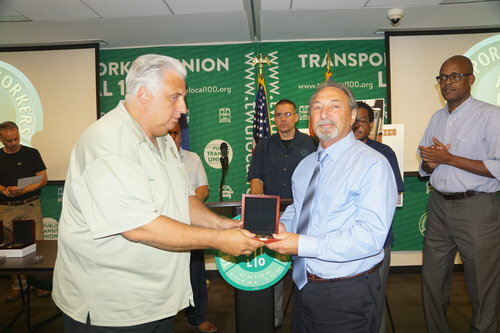 Recognition pins are given to those transit workers who participated in the rescue and recovery effort. In all, about 3,000 TWU Local 100 members were either assigned to duty at Ground Zero or volunteered to help. In his remarks, President Utano recounted the false promise by then EPA administrator Christine Todd Whitman, who assured responders that air at the WTC site was safe to breathe. 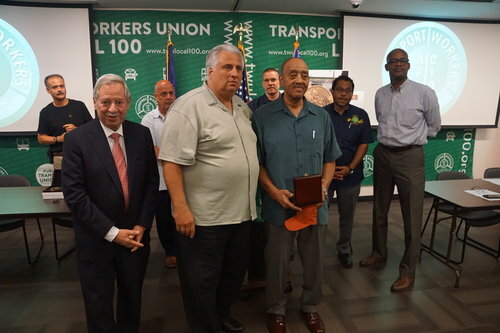 He recounted the sacrifice of thousands of transit workers who risked their health in the response and pledged to continue to push for public recognition of the role of transit workers at Ground Zero. Assemblyman Peter Abbate, Chair of the Governmental Employees Committee, who sponsored New York State's bill to compensate 9/11 workers for health care expenses, also spoke. He told the audience of transit workers that there is still more work to do in assisting those who responded. He also said that he would work to have the 9/11 transit response recognized both in the state's museum in Albany and also in the 9/11 memorial museum in lower Manhattan. Read the Daily News's coverage of 9/11 related transit worker deaths here. New York State has extended the deadline to file for workers' compensation benefits until September 11, 2022. For more information, see a workers' comp attorney.